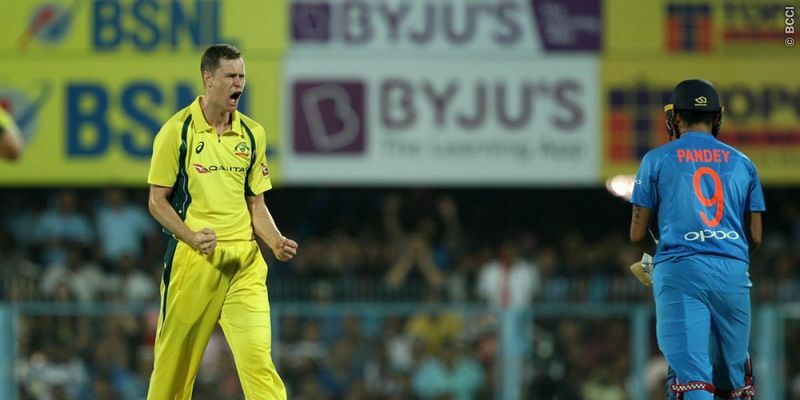 Jason Behrendorff (4/21) decimated the Indian top order to set up a comfortable 8-wicket victory for Australia in the second T20I to level the 3-match series. After restricting India to a modest 118, Moises Henriques and Travis Head stitched together a 109-run partnership to guide the visitors home. Brief scores: India 118/10 ( Kedar Jadhav 27, Hardik Pandya 25; Jason Behrendorff 4/21, Adam Zampa 2/19) lost to Australia 122/2 (Moises Henriques 62*, Travis Head 48*; Bhuvneshwar Kumar 1/9, Jasprit Bumrah 1/25) by 8 wickets. In the first international match at the Barsapara Cricket Stadium in Guwahati, David Warner won the toss and invited India to bat first. While all-rounder Marcus Stoinis replaced Dan Christian in the Australian team, Indian skipper Virat Kohli showed trust in the same set of players and didn’t tinker with his playing XI. Rohit Sharma started the innings with two boundaries on the first three balls but Jason Behrendorff, playing only his second T20I, turned the table completely on the hosts. The Western Australia pacer kept changing the length continuously and the Indian top-order batsmen seemed to be clueless while facing him. Behrendorff sent Rohit, Kohli, and Manish Pandey back to the hut leaving India languishing at 16/3. Realising the rookie pacer had momentum on his side, Warner opted to let him finish his quota of overs and the 27-year-old didn’t disappoint. He continued his carnage as he had Shikhar Dhawan caught at long-on by Warner and left India with a score of 38/4 at the end of the first powerplay. After losing a flurry of wickets, India needed the pair of Kedar Jadhav and MS Dhoni to fire on all cylinders to post a competitive total, but the former Indian skipper was sent packing in the 10th over and India were reduced to 61/5 at the midway point of their innings. Adam Zampa came to bowl the 12th over and deepened India’s woes by dismissing Jadhav (27) with a googly on the very first delivery of the over before Nathan Coulter-Nile registered his name on the scoresheet by getting the better of Bhuvneshwar Kumar in the very next over. After that, the Australian bowlers successfully controlled the run-flow as India could only manage a score of 71/7 in 13 overs - a precarious situation they found themselves for the first time in the tour. After a gap of 33 deliveries, the hosts finally found a boundary off Kuldeep Yadav’s bat which helped them reach 85/7 after 15 overs. Although Pandya hit a six to help India cross the 100-run mark, in the very next over, Stoinis sent the Baroda all-rounder, India’s last hope - back to the pavilion - much to the joy of the Aussie fans. That happiness went a notch higher as in the last over of the innings, Tye wrapped the things up with a minuscule total of 118 runs. The 119-run target seemed to be an easy one for the Australian team and when they added 11 runs in the first eight deliveries, the Indian fans would have been worried. But the Indian pacers didn’t take their foot off the pedal as Jasprit Bumrah got stand-in captain Warner for 2 while Bhuvneshwar dismissed the dangerous Aaron Finch for 8, which reduced the host to 14/2 after three overs. But Moises Henriques and Travis Head decided to go after Bumrah and scored 19 runs in his next two overs to take the score to 34/2 by the end of the powerplay. Kohli introduced Kuldeep Yadav in the hopes of getting a much-needed breakthrough but the move failed as the left-armed leggie leaked 14 runs and in the next two overs and the duo added 17 runs to take the total to 67 for 2 at the midway point of the innings. Needing just 52 runs in the remaining 60 deliveries, the visitors wanted to finish as soon as possible as the Aussie duo added 21 runs in the next two overs. Despite conceding nine runs in the next two overs, India failed to take any wickets and Henriques, capitalising on that, smashed two consecutive sixes in Kuldeep’s over which helped him complete his half-century and the team score also crossed the 100-run mark. After that, it was just a matter of time for Australia to finish off the game on a winning note and Henriques, too, didn’t waste much time as he smashed a boundary immediately to help Australia win the match by 8 wickets with 27 balls remaining.